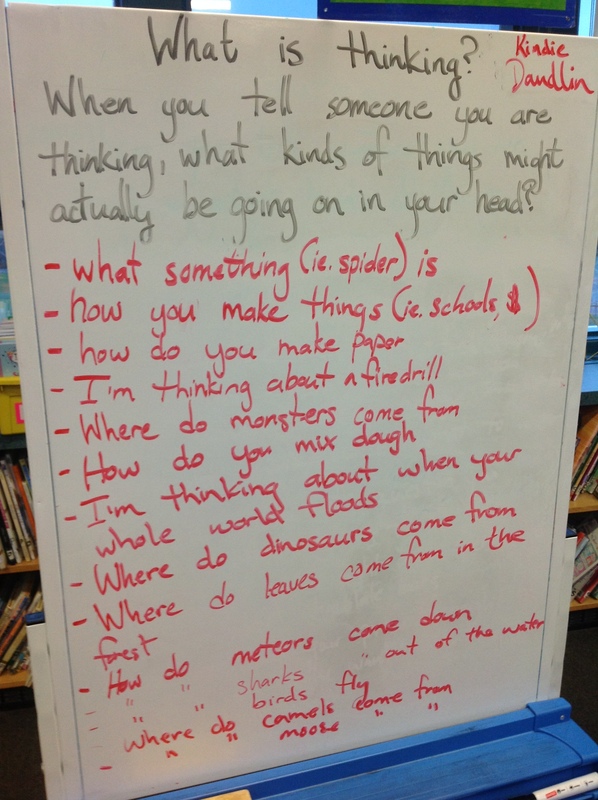 For today’s library lesson on developing questioning skills, with a focus on thinking, here is the list of amazing questions the Kindergarten children came up with today. What something (ie., spider) is ? How do you make things (ie., school, money) ? I’m thinking about a fire drill. How do you mix dough? I’m thinking about when your whole world floods. Where do dinosaurs come from? Where do leaves come from in the forest? How do meteors come down? How do sharks comes out of the water? Where do camels from from? Where do moose come from? You can see from their questions that not only do the children think and wonder about many things, but think and worry as well (#7 “I’m thinking about when your whole world floods”). The children will quickly learn that by using the 5 Ws (who, what, when, where, why and how) when asking questions, they will gain much more information, and ultimately a better understanding of their world. great questions – similar in theme to the work of Sugata Mitra and his book “Beyond the Hole in the Wall” that led to Self Organized Learning Environments – all based on foundation of strong questions! Nice sharing! !